Chop or press garlic, slice onions, and let them sit for 5 minutes to enhance their health-promoting properties. Heat broth in a stainless steel skillet over medium heat. When broth is steaming, add bell peppers and onions, cover and sauté for 5 minutes. Add snow peas and sauté covered for 2 minutes. 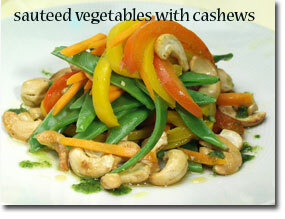 Transfer vegetable mixture to a serving bowl and toss with cashews and dressing ingredients. In numerous nations government give money to promote healthy eating. This site should get a grant for the great articles and the lovely recipe bank. I love chicken and cashew nuts. Well i am NOT a vegetarian, but love vegetarian food and eat mainly veggie dishes at home, so this is a nice veggie option for those of us who love chicken and cashew nuts but want to eat less meat. Thanks for contributing it. i'm going to try it soon.